Police have released new CCTV of the last movements of a man from Stockton who was stabbed to death while out jogging in Durham. 56 year old Peter Thomas Maine from Wynyard, was found with stab wounds near the running track of the Maiden Castle Sports Centre. He was discovered by a passing cyclist just before 8am on Sunday (1st September). Mr Maine was wearing a short-sleeved black running top, blue tracksuit bottoms and trainers and had been driving a black Land Rover. The new CCTGV footage shows a couple walking on North Bank towards Baths Bridge from the direction of Durham city. The man is wearing dark long sleeved top and dark trousers and the woman is wearing dark trousers and a red long sleeved top. Durham Police would like to speak to the couple shown in the video. Durham Constabulary said 30 detectives and staff are now working on the case and are keen to speak to anyone who saw Mr Maine that morning. It emerged that Mr Maine was under investigation for fraud by Durham Police in connection with his job as a lawyer. The Solicitors Regulation Authority had also launched an investigation into his conduct. "Peter was a loving husband to Joanna, a devoted father to Lucy and Jessica and a much-loved son of George and brother to Helen. Words at this time cannot express how we, his family, are feeling. We would ask that anyone with information regarding what happened to Peter to please contact Durham Constabulary. The police are distributing posters with a picture of Mr Maine in the hope it will prompt potential witnesses to come forward. 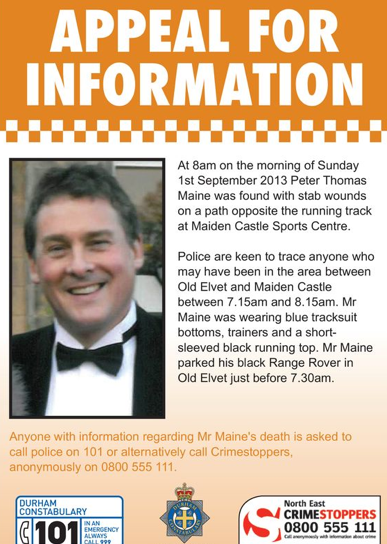 "Mr Maine's death remains suspicious but we have to keep an open mind as to how he came by his injuries.